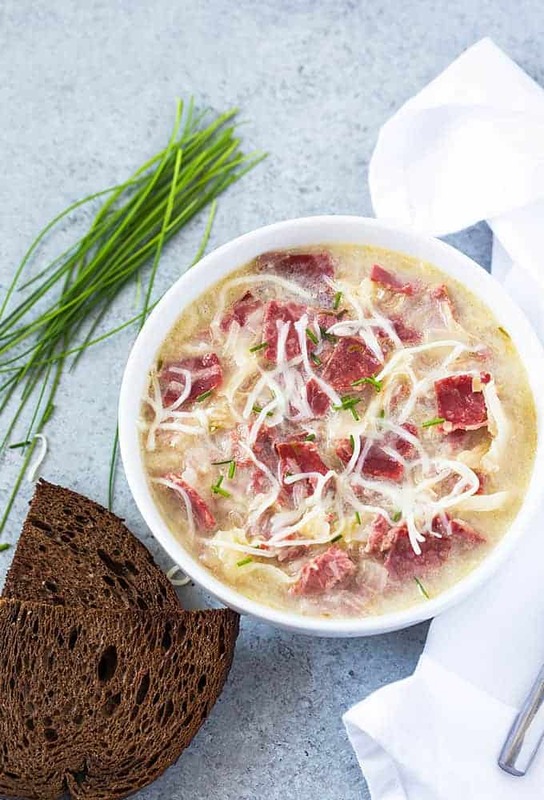 So hearty, comforting and full of corned beef and sauerkraut… if you enjoy Reuben sandwiches as much as I do, you’re going to LOVE this Creamy Reuben Soup! There’s just something about the flavors of a Reuben that I loooovvveee. 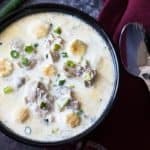 Soup is one of my favorite things to eat because it’s so comforting and reheats so well. 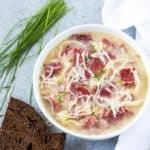 Speaking of comforting, I so much enjoyed this soup the other day after finding out I’ve gotta take Baby to a ophthalmologist specialist for her recurring eye ulcers. I took this pic recently when she was having a good day with her eye. I’m so ready for her to get some relief! 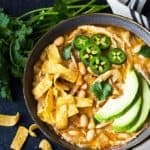 We’re going to be traveling 2 hours (one-way) to the eye specialist so you’ll probably be seeing a lot more slow cooker recipes on the blog soon. Serve with toasted rye bread (or rye croutons). 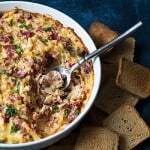 Be sure to check out my easy recipe for Reuben Dip, too… enjoy! 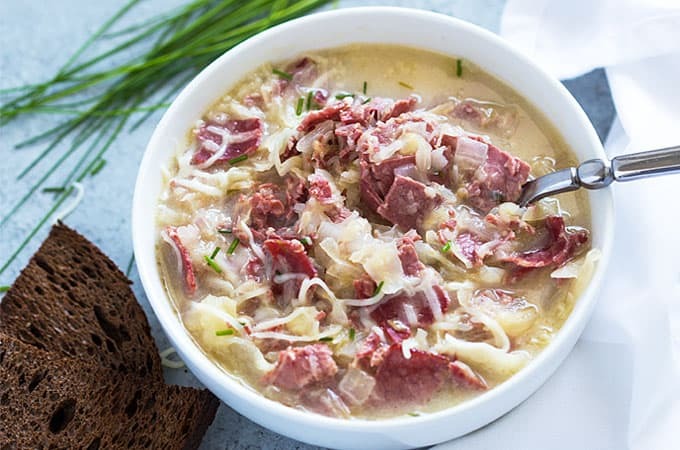 A hearty and comforting Reuben-inspired soup chock full of corned beef and sauerkraut. Melt butter over medium-high heat in a dutch oven or soup pot. Add onions and cook for 5 minutes, or until soft and translucent, stirring frequently. Add garlic and cook until fragrant, about 1 minute, stirring frequently. Stir in flour. Add the chicken broth, corned beef and sauerkraut and bring to a boil. Reduce heat to maintain a gentle simmer. Cover and simmer for 15 minutes. Add sour cream, chives and 1/2 cup of the shredded Swiss cheese. Stir well to combine and cook for an additional 2-3 minutes, or until cheese is melted. Top with remaining Swiss cheese and serve with toasted rye bread or rye croutons. 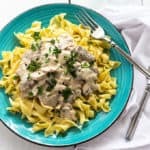 Beef Stroganoff – The Ultimate Comfort Food in 30 Minutes! This looks great! When I am down at my parents house in Morehead City this weekend I might have to make it! Made this and was AMAZING!! Made grilled cheese with rye bread and swiss cheese. 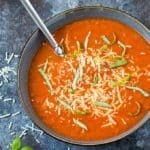 Can’t wait to try more of your soups. This was SO GOOOOOOD!!!!! I didn’t have sour cream, so actually added some thousand island dressing, and it was over the top delicious. I bought some pumpernickel bread and made croutons out of it in our toaster oven to top it. So yummy! Will be adding this to my monthly rotation. Thank you! I love Reubens sandwiches…….they are my favorite. I will defiantly try this. Just finished making and eating this and I highly recommend it! It was perfect! I only kinda-sorta drained the kraut, and didn’t have chives, but otherwise I made it exactly. It was a big hit, and it goes on the permanent rotation list. It’s tart, salty, a little sweet from the cheese and most definitely Reuben-y. Thank you for posting this little piece of comfort food heaven! 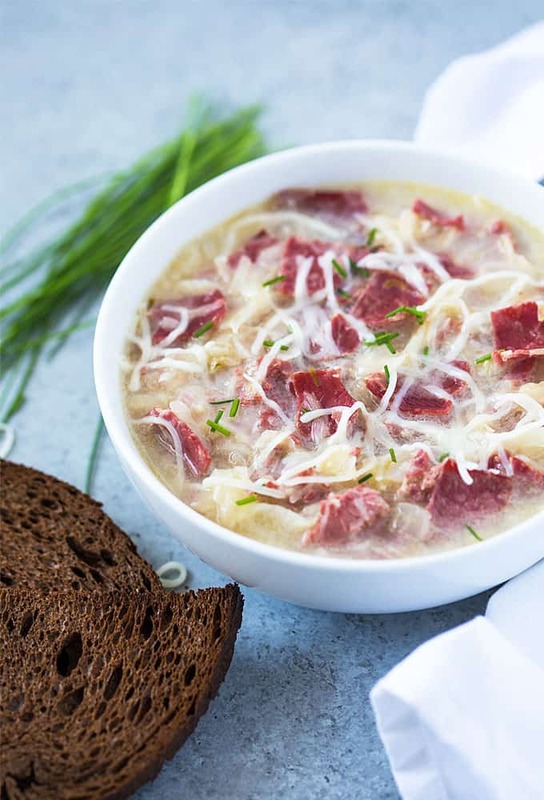 This soup is seriously mouthwatering! It’s only 11 AM and I know what I’m making for dinner, my only question is why chicken broth instead of beef broth? I’m sure it’s delicious I’m just curious. Thanks for sharing! Every winter my friends and I get together for a potluck soup night. 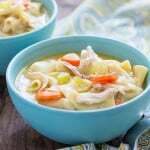 I ‘m always requested to bring this soup. This recipe is a real keeper. Thanks for sharing. I’m going to make this this weekend. 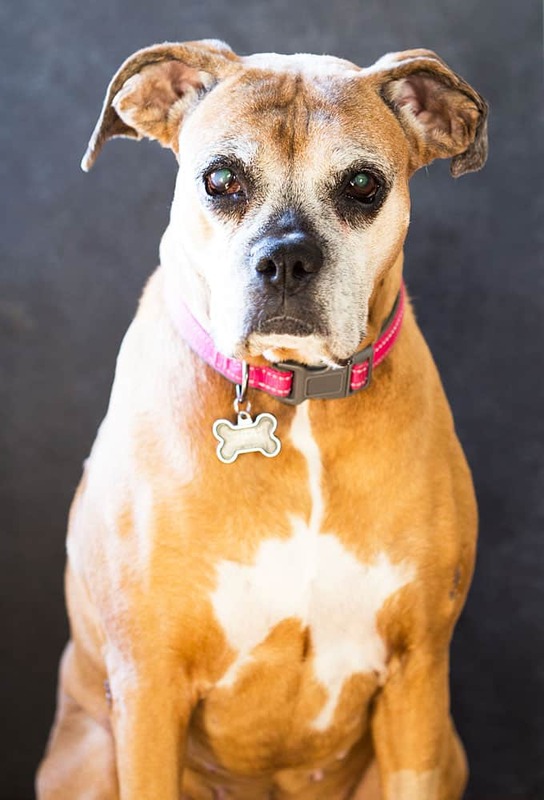 Curious how your pup is doing with his eye ulcers?